Three of Wands (R) wants you to learn to be receptive to your needs for a new direction – recognize when your talents, skills and efforts are being wasted. There will be resolution after some struggle – but, much work is still needed. The proper balance has not been obtained because you are preoccupied with your “inner” thoughts to the exclusion of outer advantages. You are actually looking away from the power that is available to you. You have become too giving and this allows others to take advantage of you. You need to check everything before moving ahead. A careless approach can ruin everything. You may experience the failure of some project due to “storms” or problems that are greater than you had anticipated. You are trying to become involved with the environment after a lengthy time of detachment and reflection which has been disturbed by negative memories. You must be alert to the new opportunities that present themselves and use them wisely. Remain open and receptive to new business ventures and partnerships with reputable people. Be willing to operate from a place of integrity as you move forward – assured in your mind that your heart, mind and spirit are in balance and you are clear on how you wish to handle upcoming situations and the important choices you will be making. There can be flaws that interfere, keeping dramatic progress on the path just out of reach. The desired qualities for this stage may be present in abundance, but for some reason, the project at hand is off target. Check, possibly right project, wrong motivation or right motivation, wrong project. Guard against over optimism and spiritual vanity as you would against pessimism. Guard against complacency as you would against a nomadic restlessness forever more and more. Strength or Justice in the spread: Keep going, you will receive your reward – you will eventually benefit from all your efforts. Next to High Priestess: Your intuitive powers will awaken now and you will know deeper understanding if you seek spiritual goals. In the first position: You may be required to use your energies more in shoring up the existing portfolio which may try your patience or you may be required to spend your time almost entirely on projections into new discoveries which may test your continuity with the past. In the second position: At one extreme, this may have the discomfort of predestination, of knowing in advance. Another extreme, you may enjoy too much this penchant for knowing. In the third position: There is still work to be done studying the past, before you can integrate the old fully into the needs of today and tomorrow. In the fourth position: The pitfall here – do not misunderstand the meaning of “living in the present”. The eternal now which passes drop by drop with our help contains all of our past and all of our future. In the fifth position: Some problems with assuming more independence, speaking your mind, organizing and re-organizing for greater effectiveness. Are your correct in your interpretations of past work? Is your work ready? Are you properly organized? In the sixth position: The heart may have a different priority or timing than you have programmed, a test of will and desire. In the seventh position: There may be doubts holding you back, but face all these fears squarely. What appears to be left behind now, will be with you in spirit on your journey and with you physically in your destination. In the eighth position: Check the scope and/or the timing of your program, also the mechanics and physical resources. 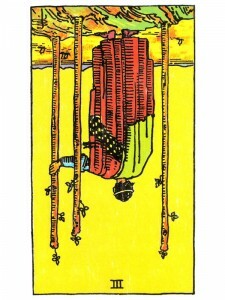 In the ninth position: For one reason or another, the heart may be hesitant to support the will in this regard. Considerable sacrifice of one thing for the other may be involved. Conversely, the heart may be pushing for action through the subconscious, perhaps against a resistant will. In the tenth position: This is a matter of the degree of efficiency with which this takes place, of how much luggage gets left behind and how far you have to jump to catch the boarding ramp as it was being raised.